After its first location in San Diego, the project was presented in the city of San Francisco, California, as part of the MEX I AM festival, organized in that city by the Ministry of Foreign Affairs of Mexico. 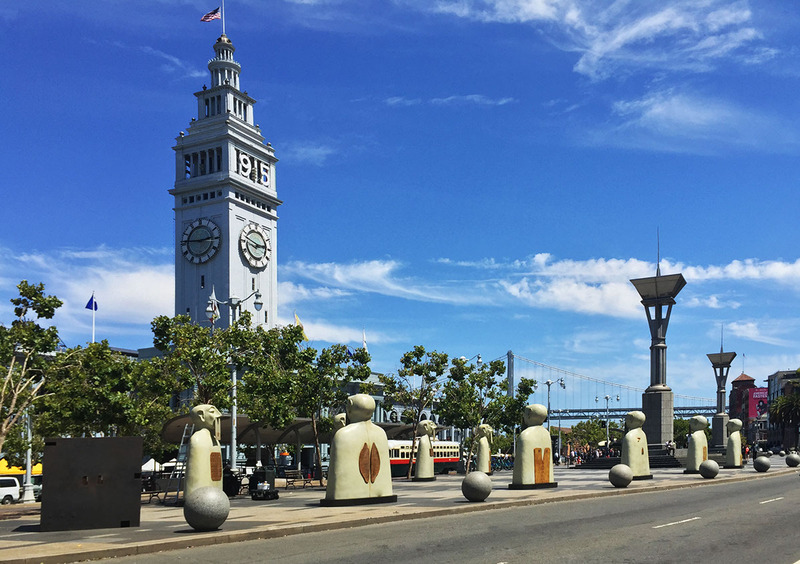 The sculptures were mounted in front of the emblematic ferry terminal building, in the district known as El Embarcadero. The history of the city is extensive and significant. Around the famous Bay inhabited by Indian tribes for centuries, before the arrival of the Spaniards. Although English also arrived −Francis Drake arrived there in 1577− it was the Hispanic Jesuits who oriented their culture through the so-called missions. In 1846 California declared itself independent of Mexico and one year later the original name, Yerba Buena, was replaced by “San Francisco”. Also around that time the gold rush spread, due to the precious metal found in the area. San Francisco was particularly benefited by this phenomenon and grew to be the largest city on the west coast. In 1869 the train whistle was heard in California; with him came the English influence, the growth of trade and a series of strict segregationist laws and customs against Japanese, Chinese and Hispanics. Although half of the city was demolished by the famous earthquake of 1906, its reconstruction was so rapid that by 1915 it was chosen as the site of the International Exposition of Panama and the Pacific. As the name implies, it celebrated the recent opening of the Canal (1914), which brought great economic prosperity to San Francisco. During the Second World War this city provided the ships with which the United States would win, particularly on the Pacific front. At the end of the conflagration, there was verified the last conference of the League of Nations, which would see the birth of the United Nations (UN). In the 1990s, San Francisco hosted a large number of world-class technology firms, thanks to its proximity to Silicon Valley. Since the 1960s, when the hippie movement that proclaimed sexual freedom, peace and love among all people flourished, San Francisco has a well-earned reputation as one of the most progressive cities in the American Union and shelter various alternative movements, both social and artistic. Special mention in this regard is the emblematic Castro District, where, according to the documentary by Morgan Spurlock, Straight Man in a Homosexual World, the United States Navy sent its homosexual soldiers there during World War II, after being discharged by such preference. This is how the concentration of people from the LGBTTT community began (which is currently 41%, while the city average is 15.4%). In 1967, during the so-called “summer of love” in San Francisco, the tolerance shown by the young people who attended the concert -whose hymn was precisely the song of the same name- and their repudiation of the Vietnam War, established the city’s reputation as a place open to freedom of thought and the pursuit of hippie ideals. Less than a decade later, Harvey Milk, who became a city councilor, began to openly advocate for LGBTTT people, becoming the first openly gay official in the United States.